Pofessional photographer, polar traveler, author and environmental advocate, Sebastian Copeland set a world record (in Greenland last year) for the longest distance traveled in a twenty-four hours period on skis and kites, with 595 kilometers. He was already accompanied by his companion Eric McNair-Landry ans they were crossing the big island on a 2.300 kilometers trek on the ice-sheet of Greenland. 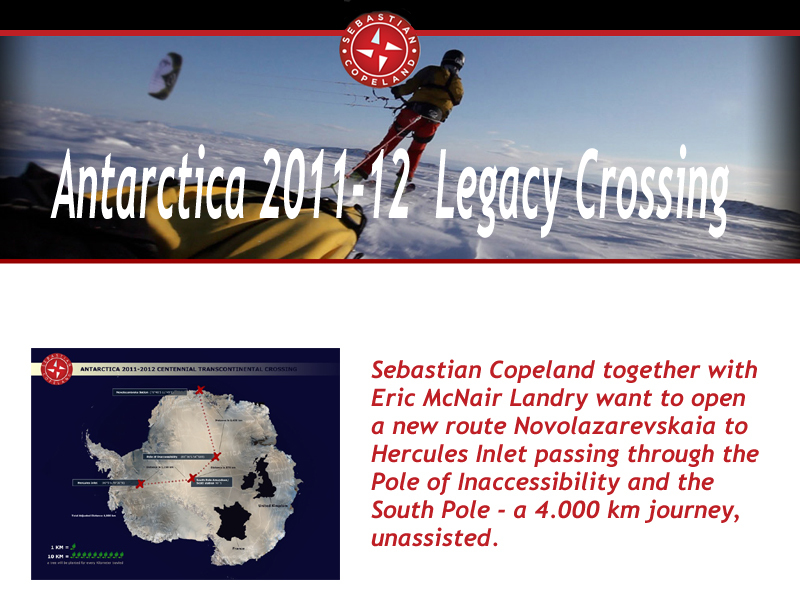 This time, with the same Eric McNair-Landry, he wants to set a new world record, opening a new route of about 4.000 km in the Antarctic. An itinerary never tried before, with the difference that this year three basque climnbers are almost on the same itinerary, the Pole of Inacessibility excepted. They think they'll be able to perform that distance -unsupported- in less than 90 days. The men will link two points never traveled before, setting tracks in places where no man has ever been. On the science side, we will be making photographic observations of the ice surface for the National Snow and Ice Data Center (NSIDC), to help determine ice accumulation in specific areas. From their press dossier : "One of the greatest challenges of this expedition will undoubtedly be the weight we will be pulling. Because the trip is un-assisted—meaning we carry everything needed from the moment we set out until we are picked up—our loads will approach 400 pounds each. Scaling up the glacier from about sea level to an elevation of around 9000 feet is like pulling a house! Negotiating the crevasse fields in the early phase of the trip will present the first set of challenges. These crevasses can swallow a truck, and testing the thin ice bridges, while pulling the heavy loads is sure to be very slow. Additionally, the cold will be with us from the start, in spite of the low elevation, given that we set off during the austral spring, when temps are still frigid. As we gain in elevation, the Antarctica deep freeze will set the tone for the rest of the expedition with temperatures never warmer than minus 25C, and often around 40C below -without wind chill. The katabatic winds can easily lower those numbers by an additional 20C degree! This is warm compared to Antarctica’s winter temperatures, which have reached an Earth record of minus 89C degrees (-128F) ! "